Once a year, the world’s finest and most beloved chefs (and the foodies who love them) converge on Miami’s South Beach for a long weekend of sand, sun, music, and truly extraordinary cuisine. Now, in celebration of the festival’s tenth year, the Food Network South Beach Wine & Food Festival Cookbook brings the glamour and the flavors of the festival to the home kitchen. Festival founder and director Lee Brian Schrager takes readers on an unparalleled all-access tour of this event, with movers and shakers of the food world and an all-star cast of chefs, including Guy Fieri, Bobby Flay, Rachael Ray, Tom Colicchio, Thomas Keller, Alice Waters, and Paula Deen. Interviews and insider stories take readers into the tents, private parties, and the very best events—such as Rachael’s Burger Bash, the BubbleQ (champagne and barbecue! ), and the Grand Tasting Village on the beach. 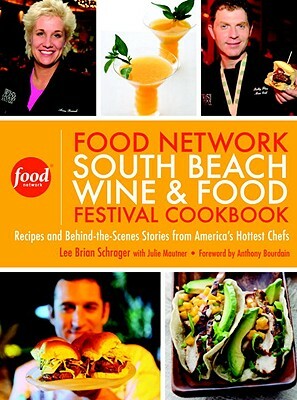 Lee Brian Schrager is credited with creating one of Miami's biggest tourist attractions, the Food Network South Beach Wine & Food Festival (SoBe, as it is known), which has raised more than $10 million for the Florida International University School of Hospitality and Tourism Management, and the Southern Wines & Spirits Beverage Management Center. Schrager's Food Network New York City Wine & Food Festival benefits the Food Bank For New York City and Share Our Strength. He is a graduate of the Culinary Institute of America and is a vice president of Southern Wine & Spirits of America, Inc. For more about the festival visit SoBeFest.com. Julie Mautner was a founding editor of Food Arts. She has written for Travel+Leisure, Food & Wine, Bon Appetit, Wine Spectator, Conde Nast Traveller UK, and Epicurious. She divides her time between the United States and France.